We are delighted to be part of this, launching an Arabic game is every Arab gamers' wish. This is a great opportunity for us to grow further in promising territories like Saudi Arabia and Egypt, and a solid demonstration of our commitment to the Middle East market...we hope it will be the first of a long line up for Arabic titles in the future... 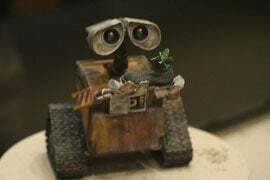 There are only few games that would suit the Middle East's morals more than WALL.E. The game depicts family virtues in a fun adventurous story line immersing the players in a world of passionate pursuit for adventure. You gotta start somewhere, we guess, and are glad to see that THQ has started. Hopefully other publishers will follow suit. As reader David pointed out, THQ isn't the first to localize a title into Arabic. Back in 2004, PS2 title 'This is Football 2004' let players select either English or Arabic commentary. Read this post right here for more info. It's written by some guy named Brian D. Crecente.